If you want to Shutdown your Local Machine in another ways in the black window Command Prompt type “shutdown – s ” without the quotes and press Enter. The command switch “-s” tells the computer to Shutdown. To Restart your Local Machine with Command Prompt Type “shutdown –r” and press Enter. The command switch “-r” telling the computer to restart after shutdown. To Hibernate a Local Computer in Command Prompt type “Rundll32.exe Powrprof.dll,SetSuspendState” without the quotes and press Enter. Your computer should hibernate, if it does not, then you must enable hibernation to do this. If you want to Shutdown or a Remote Computer with a specific time you can do in this way. 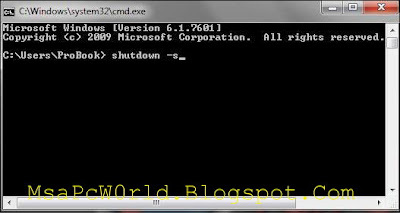 In Command Prompt type this “shutdown –s –t 60” to shutdown your computer after 60 seconds. Upon executing this, a countdown timer displaying warning message will be shown. This command uses the –t command switch followed by a variable (which is 60 in this case) which represent the number of seconds after which the computer will shutdown. To Log Off the Current User in Command Prompt type “shutdown –I “. To Stop a System Shutdown type “shutdown –a” This will stop the system from shutting down if the countdown to shut down has not reached 0. In Windows you use the Task Manager to kill tasks. However, if you've used Linux before, you are probably familiar with the ability to kill and start tasks from the command line. This tricks show you how to use the Command Prompt Process Viewer/Killer/Suspender utility to view a list of processes, kill processes, and even to change the priority of a process when you type in Command Prompt process –k “notepad.exe”. With Command Prompt you can chat with your friends easily with this simple trick. You just need you friend IP and your Command Prompt. See this tricks. 1. Open the Office Word 2013 or Notepad and paste this code. 2. Now this file in Word 2013 or Notepad save with the name “Msn.bat”. 3. Then open your Command Prompt and drag the file (.bat) over to the Command Prompt and then press Enter. 4. So then Command Prompt show you the Msn and User. 5. In the User field you just enter your friend IP. 6. After that just enter you message want to send to your friend. This trick tell you how you can chat with Command Prompt so Start Chatting.